Spray foam insulation can is one of interesting material that you can use when you are building your house. When someone has seen it for the first time, he will feel surprised with this thing. Since, it has unique appearance that is quite different with other building material. This insulation is quite easy to be applied. It can be used in the ceilings, walls, crawlspaces, and the other place of your building. Perhaps, one bug question appears in your mind, what is actually the function of this insulation? The function of this spray foam insulation is to keep the heat inside your house when the outside weather is cold. And in the contrary, it can also keep your home inside from the hot air outside the house when the weather is hotter. It is so amazing. This insulation is actually composed from certain chemicals such as isocyanides, polyurethane, resin, and other chemicals. 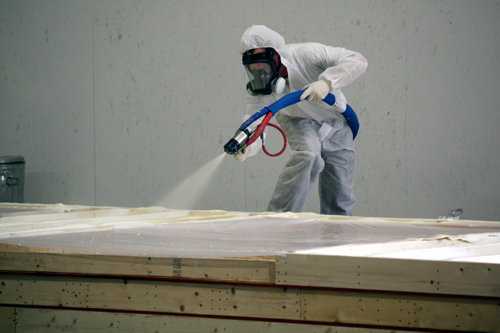 When the spray insulation is sprayed, the chemical and resin will immediately produce foam that will solidifies and expand quickly in the certain places. This kind of insulation is much recommended to be applied by the professionalism. But, since nowadays the spray foam insulation kits are available in the market, it can be applied in your house by yourself. Applying spray foam insulation to your house will give you some advantages. The first advantage is certainly on the quality of the insulation. The spray insulation can fill and come in to the crannies and tiny nooks, so it can keep the building warmer when the outside is cold. It will keep the air inside the house from the cold air outside, since the cold air itself will not be able to escape. 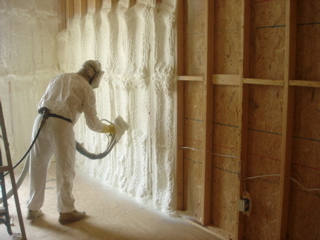 More than that, the spray foam insulation will also adhere well to the surface of the house part. This make the spray insulation can be applied in any part of the house such as walls, floors underside, and many other place. The other advantage is related to the environment. There will no particles of fiberglass that is floating in the air. Even though the spray insulation can give you many advantages, but it can also give you some disadvantages. It has become the general truth that the higher quality will also have higher price. This is the reality of this kind of fiberglass. The spray foam insulation cost is most expensive than the fiberglass insulation. Besides that, spray foam insulation can also cause dangerous caused of the foam that is sprayed to the air.